What Kind of Missiles Did North Korea Launch on August 26? The United States, South Korea, and Japan didn’t seem to agree on what North Korea launched. On Saturday morning, North Korea carried out a launch of at least three projectiles from its east coast, into the Sea of Japan. The launches took place from Kittaeryong in Kangwon province and come during the 2017 iteration of the United States’ and South Korea’s Ulchi-Freedom Guardian computerized command post drills. The launches were the first since North Korea’s test of an intercontinental-range ballistic missile (ICBM) on July 28 and came following weeks of tension with the United States over a threat by North Korea to strike the waters near Guam. North Korea commonly stages ballistic missile launches during prominent U.S.-South Korea military exercises. In March, ahead of the start of the U.S.-South Korea Key Resolve and Foal Eagle military drills, Kim Jong-un oversaw the salvo launch of four Scud 2 ballistic missiles, for example. Last year, during Ulchi-Freedom Guardian, North Korea carried out a flight test of its submarine-launched ballistic missile. Pyongyang treats the U.S.-South Korea drills as a ruse for preemptive war and regularly also stages its own conventional exercises too. While North Korea launched projectiles, not everyone agreed what precisely it had launched. In the immediate aftermath of the launch, competing assessments emerged from the United States, South Korea, and Japan. Initially, South Korea’s Yonhap news agency, citing the country’s Joint Chiefs of Staff, had reported that a single short-range ballistic missile (SRBM) had been launched to a range of approximately 250 kilometers from North Korea’s Kangwon province. Later, this was revised to note that “several unidentified projectiles” had been fired for approximately 250 kilometers in a northeasterly direction. A spokesperson for South Korea’s presidential office, following an emergency meeting, said that the “the unidentified projectiles fired by the North today are presumed to be improved 300-mm artillery rockets from a multiple-rocket launcher,” implicating the use of the KN09 multiple-rocket launch system (MRLS) system. The presidential office spokesperson did not comment on why the South Korean Joint Chiefs of Staff had released a divergent assessment earlier on. As South Korea released and updated its assessments, U.S. Pacific Command (PACOM) released an initial statement noting that three short-range ballistic missiles had been launched at 10 minute intervals, with the first and third failing in flight and the second exploding shortly after launched. PACOM then issued a revision of its original assessment, clarifying that the first and third missiles flew to a range of 250 kilometers. Concurrently, a Japanese assessment suggested that the missiles tested were perhaps shorter-range MRLS projectiles, rocket artillery, or even another kind of shorter-range missile, like the KN02 Toksa. Japan’s statement could have also implicated the use of the KN09 300mm MRLS system, which has in the past been conflated with ballistic missile launches. The Japanese Ministry of Defense released a statement (PDF) noting that the “flight of objects such as ballistic missiles that could fall into Japan’s territory and exclusive economic zone (EEZ) is not confirmed,” suggesting that SRBMs may not have been involved. The Diplomat asked Pacific Command to clarify if its revised assessment stood by the initial assessment that North Korea had tested “short-range ballistic missiles,” which are defined as missiles with a maximum range between 300 kilometers and 1,000 kilometers. PACOM confirmed that the SRBM assessment remained valid despite the update. For systems with maximum ranges under 300 kilometers, the United States uses the designation “close-range ballistic missile.” This would apply to rocket artillery and MRLS systems like the KN09 as well. The releases to come out of the United States, South Korea, and Japan revealed the considerable challenges that the countries continue to face in accurately assessing certain kinds of North Korean ballistic missile launches. Unlike the highly-lofted developmental tests of longer-range systems like the Hwasong-12 intermediate-range ballistic missile and the Hwasong-14 intercontinental-range ballistic missiles (ICBMs), shorter-range tests can and often do cause the three governments to put out competing early assessments. In most cases, U.S. PACOM’s assessment ends up the most accurate. The United States possesses a more comprehensive network of ground-, sea-, air-, and space-based sensors capable of detecting and measuring North Korean ballistic missile launch activities. South Korea and Japan each rely on a more limited range of sensors. Saturday’s launch followed a major North Korean military exercise to simulate a special forces invasion of a South Korean island. In released imagery, North Korea did show the use of several rocket artillery systems. However, Kittaeryong, the site of Saturday’s launch, has been associated with North Korean Scud launches in the past. 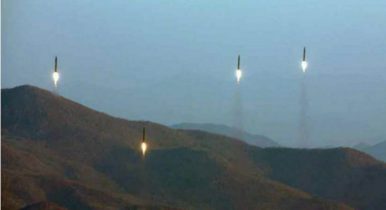 If Saturday’s launches were intended to test the readiness of the Korean People’s Army Strategic Forces for a conflict, like the March 2017 salvo launch of four Scud 2 medium-range ballistic missiles, it is notable that North Korea chose to fire three Scud projectiles at ten minute intervals, according to PACOM, instead of a coordinated salvo launch. The testing of these missiles at intervals could suggest a developmental purpose to the tests, if they indeed involved SRBMs. North Korea is thought to possess an inventory of hundreds of Scuds and could be testing new types of modifications to upgrade its existing stockpile. The short-range flight and the failure of one missile could suggest that North Korea may have been testing new forms of guidance, maneuverability, or even piloting physical differences, like a finless design. The relatively short range of the launches, at 250 kilometers, and the northeasterly direction from Kangwon would also keep the missiles within range of North Korea’s own telemetry sensors and radars, allowing its engineers to observe the flight in close detail. Saturday’s test also has important diplomatic significance. North Korea decided to potentially launch new SRBMs just days after U.S. Secretary of State Rex Tillerson commended Pyongyang for showing “some level of restraint” in withholding from new ballistic missile tests in violation UN Security Council resolutions since its July 28 test of the Hwasong-14 ICBM. Tillerson, along with U.S. Defense Secretary Jim Mattis, has called on North Korea to “signal its desire to negotiate in good faith” by immediately ceasing its “provocative threats, nuclear tests, missiles launches, and other weapons tests” weeks earlier in the Wall Street Journal. In the aftermath of Saturday’s test, Tillerson noted that the United States would not abandon its pursuit of a diplomatic solution. “We’re going to continue our peaceful pressure campaign, as I have described it, working with allies and working with China as well to see if we can bring the regime in Pyongyang to the negotiating table with a view to begin a dialogue on a different future for Korean Peninsula and for North Korea,” he said.